When I listened to this, it made me realize why I like the book so much. It’s got a real 1960s-era science fiction feel to it, And by that, I don’t mean some kind of self-conscious retro tone — as in space aliens with beehive hairdos and Nehru jackets. It’s more in the overall approach of the book. See, I read a lot of 1960s-era science fiction when I was a kid back in the ’70s. That was an exciting time for the genre. It was starting to break free of its shackles as strictly a genre about laser guns and rocket ships. The writers at the time realized that the nature of science fiction — the ability to create entire worlds, entire histories — freed them up to explore ideas in a way the more staid dictates of mainstream fiction would not allow. Some of the stuff that arose from that movement was great. Some wasn’t so great. And some was just weird and confusing. But there was still an underlying excitement to all of it, even the ultimately unsuccessful experiments. It was an exhilarating experience, starting on a book or short story and having absolutely no idea where you’d end up. Don’t get me wrong, There’s still plenty of great science fiction out there. But it seems to me the genre as a whole has become kind of a victim of its own success. It’s become simultaneously more mainstream and more insular. So much of it is locked into either offshoots of one franchise or another, or specific sub-genres such as steampunk — all in the interests of delivering what amounts to a processed product to a predetermined audience. All calculation. No exhilaration. So that’s what I like about “Immaculate Deception.” It’s a well-written book. The plot hangs together, The characters act like real people. It’s not just a bunch of weirdness for the sake of weirdness. But it still has that wildly experimental flavor to it, which first turned me into a science fan back in the day. See, the story’s about … Ah heck, just listen to the interview. Like naming my favorite movie or favorite song, naming my favorite author is a tricky and ultimately futile proposition. It depends on what mood I’m in, and varies by the hour. 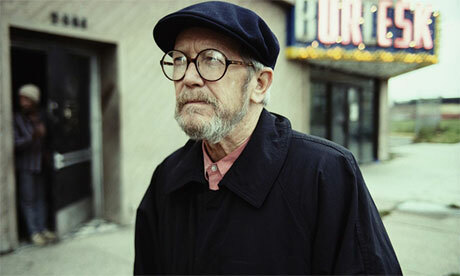 But Elmore Leonard, whose death at the age of 87 was announced today, would always be on my short list of all-time favorites. It’s been that way ever since I picked up “Freaky Deaky” on a whim about 20 years ago, and got hooked. He was a game-changer for me as a reader, and I like to think he was a major influence on me as a writer. So it pains me to say this. But I think he’s kind of a victim of a condition I call Led Zeppelin Syndrome. That doesn’t reflect badly on him, though. Quite the opposite. See, Led Zeppelin was a great band. But through no fault of their own, they inspired a lot of crap from would-be imitators who totally missed the point. Just about every godawful ’80s hair band who thought that a screechy vocalist, noodling guitar solo, and glam fashion sense would buy them rock immortality is an indirect result of Led Zeppelin’s greatness. Hey folks! I haven’t been posting for a long time. Two good things happened. I got a new job and my book, “The Freak Foundation Operative’s Report,” got released. But those two things happening at the same time was kind of inconvenient. I’ve been putting in some long hours at the new job, going through training and whatnot. And I had some technical glitches getting the book up on Amazon, Anyway, I’m back and here’s the book. Yaaaaaay!